The 5th Annual Wheels of Courage Car Show is revving up for another great year. You can be involved by registering your vehicle, purchasing a sponsorship, or a t-shirt. All proceeds benefit the Spirit of Courage Charitable Patient Fund at Methodist Jennie Edmundson Hospital. Charitable Patient Care is one of the most rewarding programs. For hundreds of Methodist Jennie Edmundson Hospital patients in genuine need each year, coping with serious illness and mounting medical bills at the same time can be overwhelming. 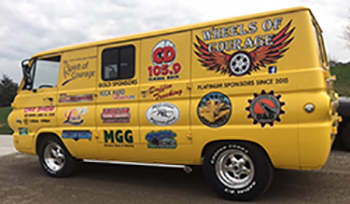 Funds raised during the Wheels of Courage help relieve some of the financial burden with funding for medical services, therapy and prescriptions. Cars must be registered by 11:00 am to qualify for awards. 12:00 pm; Awards at 3:00 pm. Register or Sign Up to Sponsor the Event Today! Registration form is available here. Sponsorships are available by calling 712-396-6040. You can also register or sign up to be a sponsor online here. Purchase your raffle tickets for a chance to win a 1999 Pontiac Firebird to be raffled on Saturday, June 22nd, 2019 at the Wheels of Courage Car Show! Tickets are $20 each or purchase six tickets for $100! Tickets will be available for purchase at Quaker Steak & Lube Thursday night car shows beginning May 2nd. All proceeds benefit the Spirit of Courage Charitable Patient Care fund. Need not be present to win.